Change is coming…are you ready? Do you have staff with children requiring childcare? Do you provide them with a Childcare Voucher scheme to help them save money on their childcare costs? Did you know that it’s all change in the autumn? The Government is launching the new Tax-free Childcare scheme, which will be available to working parents to help make their childcare costs more affordable and to encourage more parents back to work after having children. If you already offer Childcare Vouchers to your staff or are considering setting up a scheme, now is the time to maximise savings for your organisation and employees. Act NOW before it’s too LATE! 1. Tax-free Childcare will see the Government subsidising 20% of an employee’s childcare costs, providing a saving of up £2,000 per child, each year. To access these savings, parents must spend £8,000 per year. 2. When Tax-free Childcare is launched, only those employees already using Childcare Vouchers can continue to benefit from their savings – new parents will not be able to join scheme. 3. Childcare Vouchers will remain available for as long as they are required. 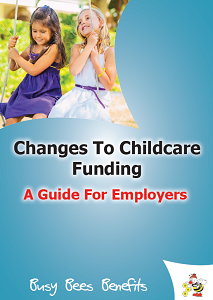 Therefore, choosing to offer a scheme now and promoting it to your workforce will ensure all those working parents currently paying for registered childcare, know about the scheme and understand how they can make savings. Even if employees will be better off using Tax-free Childcare, they could save up to £77* per month using Childcare Vouchers before the new scheme is launched. This could be even more if both parents join their employer’s Childcare Voucher scheme. Employees only need to have a deduction of £10 a month to remain on the scheme, which will give them the right to choose which scheme will be most beneficial for their family. 4. The more employees you have on your scheme, the more your organisation will save on Employers National Insurance contributions. For every employee using Childcare Vouchers, your organisation can save up to £402 per year. However, as Tax-free Childcare is not run through employers, organisations will lose these savings if they do not offer Childcare Vouchers. Retaining skilled staff is a must for organisations. With many now offering a range of employee benefits, making your company look as attractive as possible is key. The way to do this is to introduce employee benefits which will be valued by staff, especially Childcare Vouchers. Childcare Vouchers are must have for working parents, with many believing they influenced their decision to return to work, to remain with their current employer or to change jobs to benefit from their savings. Is the Childcare Voucher scheme stable? With the introduction of Tax-free Childcare, many Childcare Voucher providers will be disappearing from the market, especially those only specialising in Childcare Vouchers. Rest assured Busy Bees Benefits are not going anywhere! As an employee benefits provider offering an array of salary sacrifice, lifestyle and business benefits, we will continue to provide Childcare Vouchers to organisations as long as they are required by working parents. Our association with Busy Bees Nurseries, the largest nursery network in the UK with over 230 settings nationwide and 60 settings in South-East Asia, means our financial stability will be supported throughout the changes and beyond. Funds are safe with us. All funds are ring-fenced and as such, they are not used to fund our operating expenses. There are few providers that can give you such a guarantee. Employees that do not have a requirement for childcare vouchers at the current time, from April 2015 they only need to have a deduction for as little as £10 to join your Childcare Voucher scheme….and vouchers can be saved up to be used when they are required. If you would like some more information about the changes and how they will affect your and your staff, please click the image below to download a useful guide for employers. For more information or to discuss your organisation’s options, please contact Busy Bees Benefits on employer@busybeesbenefits.com or call 0330 333 9100. *Basic Rate tax payers. Higher rate can save £52 and additional can save £51.67 per month.